Jharkhand Chief Minister Arjun Munda’s victory in the vote of confidence in the State Assembly on Tuesday vindicates the National Democratic Alliance’s consistent claim of majority support ever since the election results threw up a fractured mandate on February 27. In the 81-member House, 40 voted in favour of the motion while 37 opposed it. Time was when the handing over of an investigation to the CBI was a guarantee for impartial enquiry. Things have become topsy-turvy since then. Today, a CBI enquiry moves or stalls at the sweet will of the party in power. A classic case is the Rs 175-crore Taj corridor scam in which former Uttar Pradesh Chief Minister Mayawati is in the dock. A section of the senior citizens — vocal, urban and relatively better-off with an annual income of more than Rs 1.5 lakh— are agitated over some of the 2005-06 budgetary proposals threatening their existing tax concessions. Some have just got it wrong, others have a valid point to make. Mr Somnath Chatterjee, the seasoned lawyer opted for a sagacious course of a Presidential reference because he, as Speaker of the ultimate legislature — the Lok Sabha — did not want the March 9 order of the Supreme Court to remain as a precedent. He would surely know that it was plainly inconsistent with the privileges of the legislature. Gibbon worked 20 years writing The Decline and Fall of the Roman Empire. Plato wrote the first sentence in his Republic in nine different ways before he was satisfied with it. Burke wrote the conclusion of his speech at the trial of Hastings 16 times, and Butler his famous Analogy 20 times. While Ms Condoleeza Rice’s talks in New Delhi are going to be wide-ranging, they can have a bearing on future defence cooperation between India and the United States. While the F-16’s are likely to figure in the talks, the United States is now offering India the advanced version of Patriot PAC-2 missiles with the radar of the latest PAC-3 missile so that as when India is ready, it can upgrade its anti-Ballistic Missile Defence (BMD) capability. If you live near any major thoroughfare, you might have noticed how the decibel levels have increased in recent years. It’s a problem that is becoming steadily worse and widely shared. China’S new “anti-secession” law authorising the use of force against Taiwan has sent ripples of alarm throughout the region and beyond, drawing a stern reaction from the US, and casting new uncertainty on European plans to resume arms sales to Beijing. Jharkhand Chief Minister Arjun Munda’s victory in the vote of confidence in the State Assembly on Tuesday vindicates the National Democratic Alliance’s consistent claim of majority support ever since the election results threw up a fractured mandate on February 27. In the 81-member House, 40 voted in favour of the motion while 37 opposed it. Three United Progressive Alliance members including a Nationalist Congress Party member were absent. Mr Inder Singh Namdhari of the Janata Dal (United) was elected as the Speaker and as such did not vote. The proceedings in the House would have been smooth but for the bedlam created by the UPA members. They questioned the agenda and demanded the disqualification of two members for switching sides. Mr Namdhari, however, preferred to go ahead with the mandated floor test. In a democracy, a party or coalition can form the government and remain in power only if it commands the majority support. Jharkhand, however, was forced to pass through an unprecedented crisis only because Governor Syed Sibtey Razi short-circuited this fundamental principle and appointed Mr Shibu Soren as the Chief Minister on March 2. Surprisingly, he refused to recognise Mr Munda’s majority until March 11 — that too, after the Prime Minister’s intervention following Mr Soren’s failure to seek the floor test directed by the Supreme Court. Now that Mr Munda has proved his majority, he will have to walk a tightrope because of the government’s slender majority in the House. Under the Constitution 91st (Amendment) Act, 2003, Mr Munda will have to keep the ministry’s strength to 12. He has already appeased five Independents with ministerial berths. How many more he can accommodate from the BJP and the JD (U)? The Independents may have been rewarded for their crucial support, but it remains to be seen whether it would trigger dissidence in the NDA. Mr Munda has sought the Opposition’s co-operation in the smooth running of the government. It is a moot point whether the latter would respond to the appeal favourably. Time was when the handing over of an investigation to the CBI was a guarantee for impartial enquiry. Things have become topsy-turvy since then. Today, a CBI enquiry moves or stalls at the sweet will of the party in power. A classic case is the Rs 175-crore Taj corridor scam in which former Uttar Pradesh Chief Minister Mayawati is in the dock. The case has got switched on and switched off depending on the political compulsions and convenience of Dilli Durbar. Her support can be again crucial for the Congress and, quite predictably, the CBI has decided to file a closure report without even seeking the court’s permission. It was also required to seek the opinion of the Central Vigilance Commission under the CVC Act before doing so but even that compulsion was dispensed with. It is hard to digest the claim that this turnaround had no political backdrop. That is why the Supreme Court has directed the CVC to scrutinise the material with the CBI and submit a report whether to close the case or not. The unusual order of the apex court is a stinker not only for the CBI but also for the politicians. Earlier, the NDA government did not want to probe the Taj corridor scandal because of the fear that it would not get Ms Mayawati’s support in the Lok Sabha; after the Lok Sabha polls, the Congress party’s calculations are no different. Ms Mayawati’s hands look clean to the CBI. If the CVC holds that the CBI was wrong in closing the case, its cup of woes will overflow. But considering the thick skin that the persons concerned have developed over the years, it is unlikely that there will be many red faces in the corridors of power. Given the way things are going, it can be certain that there will be similar cases in future also. The direction will, hopefully, have a bearing on them at least. The CBI will have to be on guard that it does not cut its suit according to the convenience of the ruling dispensation. A section of the senior citizens — vocal, urban and relatively better-off with an annual income of more than Rs 1.5 lakh— are agitated over some of the 2005-06 budgetary proposals threatening their existing tax concessions. Some have just got it wrong, others have a valid point to make. Also, a vast majority of the aged, particularly residing in rural India, has no pension or any social security, no forum or organisation to articulate their problems. They have been neglected by the successive Finance Ministers. With improving standards of living, rising medical costs, longer life expectancy and high aspirations, most senior citizens are an insecure lot, forced to make more demands on the government. A genuine grievance of the elderly tax payers is that the Budget has knocked off the Section 88B rebate, which allowed a tax deduction of Rs 20,000. In lieu of this, the Budget raises the exemption limit for tax on income of the senior citizens to Rs 1.5 lakh from the present Rs 1 lakh. Another is the dumping of Section 80L, which makes interest on bank deposits taxable. Finance Ministry mandarins miscalculated the effect of the new tax proposals, which, if implemented, would leave the elderly worse off than now. The tax payees can avail a deduction of Rs 1 lakh from their taxable income if they make that much savings. Most retirees, however, can no longer save and they usually live off their past savings. Hence this benefit is of not much use to them. One misgiving that is widely prevalent is regarding the tax on interest income from instruments like PPF, NSC and bonds. Mr P. Chidambaram has made no change in the taxation of interest income received from such instruments. The fringe benefits tax can make the employers redraw the salary structure to reduce taxable superannuation benefits. What is usually not appreciated is that the medical expenditure on self or a dependent is among the six tax deductions still recognised. On paper the Budget tries to help the aged, in practice it lets them down. Mr Chidambaram should think from their point of view. The concept of the ‘official secret’ is its (bureaucracy’s) specific invention. The Governor of Jharkhand committed an obvious fraud on the Constitution by appointing a person belonging to the minority group as Chief Minister and giving him unduly long time to purchase MLAs to muster the majority. However, what the Supreme Court did on March 9 would only support the old saying, “Hard cases make bad law”. From the newspaper reports, it appears that the court gave several directions to the Speaker — that he should administer the oath of office to the newly elected members, that on the next day the floor test should be conducted, that this should be the only agenda of the Assembly for the day, that proceedings of the House on March 11 should be peaceful and disturbance-free, that the Speaker should report to the court the outcome of the proceedings, that the proceedings be videographed. It may be noted that the constitutional authority to summon the House, the Governor, had not asked the Assembly to meet on March 11, but the court dispensed with the requirement of a notice of summoning of the Assembly and the court’s order was a substitute. The video-record was to be placed before the court. By all accounts, the court took over the functions of the Governor and the Speaker — in fact the whole legislative process. Describing this an invasion into the precincts of the House may not be an unpardonable exaggeration. A law-knowing Speaker like Mr Somnath Chatterjee cannot but be perturbed. It has always been understood that the court could interpret the constitutional provisions, even those relating to the legislative wing. The Constitution is what the court says it is. The court can declare any action of the Governor or that of the Speaker as being unconstitutional. But can it direct the Speaker to act in a particular manner — say video-record the proceedings and to report to the court? And what if the Speaker refuses to obey? Throughout the long history of the evolution of parliamentary democracy, the issue of that institution’s honour and its privilege was constantly guarded with the zeal that would put the religious fundamentalists to shame. Our Constitution adopted all of it. A classic example of our legislatures’ fervour for privilege was provided by the conflict between the legislature and the High Court in Lucknow. In March 1964, one Keshav Singh was imprisoned by the order of the UP Assembly Speaker for committing contempt of the House. An advocate, B. Solomon, presented a petition on his behalf to the Lucknow Bench of the High Court praying for his release. A two-judge Bench of the High Court, after hearing the government advocate, passed an order that Keshav Singh be released on bail. The Legislative Assembly considered the action of the judges a breach of the privilege of the House and proceeded to resolve that the judges and the lawyer had committed contempt of the House. The Speaker ordered the arrest of all three — the two judges of the High Court and the lawyer — and wanted them to be produced before the House. The two lordships who heard the news over the radio rushed to the Allahabad High Court and filed petitions questioning the resolution of the House. A Full Court consisting of all 28 judges of the High Court entertained the petition and passed an interim order prohibiting the implementation of the resolution of the House. The mounting confrontation between the legislature and the judiciary impelled the President of India to make a reference to the Supreme Court under Article 143 of the Constitution. The questions referred for opinion were mainly centred round the facts of the case. A seven-judge Bench of the Supreme Court, after hearing arguments from a galaxy of legal luminaries, held that while the courts could not interfere with the legislature’s sphere, they had the power to determine what were the privileges of the British House of Commons at the commencement of the Constitution that were preserved by our Constitution and whether any of them had become inconsistent with the Constitution of India. That showed the reverence that the legislature commanded. Mr Shibu Soren and his three other JMM colleagues had in 1992 voted opposing the no-confidence motion against Prime Minister Narasimha Rao allegedly for monetary consideration. On this count a criminal case was launched against them. Eventually, a Constitution Bench of the Supreme Court by a majority verdict held that to enable members to participate fearlessly in parliamentary debates, they must have the protection of immunity against all civil and criminal proceedings that bear a nexus to their speech or vote, and Article 105(2) of the Constitution provides such a protection. Accordingly, criminal proceedings against them for taking bribe to vote inside the House in a particular manner were quashed. In the words of the court, “By reason of the lucre that they received, they enabled a government to survive. Even so they are entitled to protection that the Constitution plainly affords them. The court’s sense of indignation should not lead it to construe the Constitution narrowly, impairing the guarantee to effective parliamentary participation and debate”. The court’s respect for parliamentary privileges went so far. After the anti-defection law — Tenth Schedule to the Constitution — came into force on March 1, 1985, questions arose whether the decision of the Speaker on the issue of disqualification of a member of a House could be interfered by the High Courts or the Supreme Court. Notwithstanding the clear provision that no court shall have any jurisdiction in respect of any matter connected with the disqualification of a member, the Supreme Court in 1992 held that the Speaker while deciding the question of disqualification acts only as a statutory authority, and, therefore, his decision shall be subject to judicial review. While holding so, it was reiterated that a Speaker, acting as such, is beyond the court’s jurisdiction. Notwithstanding the Supreme Court’s decision, Dr H. Borobabu Singh, who was the Speaker of the Manipur Legislative Assembly, continued to hold the view that a Speaker’s decision was final. When the Supreme Court reversed some of his decisions, the Manipur Speaker not only refused to implement them but also punished the Secretary of the Assembly who took steps to implement the Supreme Court’s orders. The Speaker was hauled up for contempt of the Supreme Court. But Mr Borobabu Singh refused to appear before the court. Even the Central Government pleaded helplessness in the matter of procuring his presence. Finally, the contempt proceedings were dropped on March 23, 1993, as soon as he showed his face before the court — no apology and no punishment. The Jharkhand Speaker could rely upon the unfortunate precedent. With Jharkhand and Goa experiences too fresh to be ignored, in a possible Presidential reference, it is reasonable to expect an opinion more clearly defining the court’s powers to give directions to all other Constitutional authorities to act strictly in accordance with the Constitution, particularly to remedy a fraudulent exercise of power; the protection afforded by Article 361 to the Governor would be available in respect of bonafide exercise of power — not to shield malafide actions. Whether an act is bonafide or malafide is undoubtedly a matter to be decided by courts on the basis of evidence. The ruling party, perhaps, did not want to invite such a risk — hence understandably they left Somnath Da in a lurch. But the attack on him by the NDA cannot be appreciated except by attributing it to “habit”. They missed a golden opportunity. The outcome of Keshavananda Bharathi or ADM, Jabbalpur, would not have been the same at all times. Gibbon worked 20 years writing The Decline and Fall of the Roman Empire. Plato wrote the first sentence in his Republic in nine different ways before he was satisfied with it. Burke wrote the conclusion of his speech at the trial of Hastings 16 times, and Butler his famous Analogy 20 times. Virgil spent seven years on his Georgics and twelve on Aeneid. He was so displeased with the latter that he attempted to rise from his deathbed to commit it to flames. None of them perhaps concurred with John Ruskin who believed that no good work whatever could be perfect, and the demand for perfection was a sign of misunderstanding of the ends of art. Nor do the big bosses of bureaucrazy, classically classified as wise, unwise and otherwise. They are now labelled as hardly-working and hard-working. A hard working boss does all that a hardly working type does but works really hard when he is presented a draft-letter for final approval. Let me mention that he practises “Management by writing letters” and seeks to solve each and every problem by writing letters to his superiors, juniors and peers. That he thinks thrice before signing a letter is another matter. He picks up a red pen and attacks the draft replacing “kindly” with “please”, striking out the definite article here and there, repositioning the prepositions and re-ordering the sequence of sentences. Occasionally he frets and fumes at the soul sitting across him in rapt attention. His face clouds and eyes roll when his junior dares to point out a silly mistake of the boss who then deigns to score out a couple of sentences to add a few. Phew. Knowing that the hard-working boss has a fetish for correcting ad nauseam every draft put up to him, his juniors have stopped working hard on such drafts and enjoy delegating this task to the boss; let him waste — sorry, invest — energy in giving fond and finishing touches to the dear draft. But when things went too far, a bright spark in the office decided to tame the hard-working boss in his tracks. One day he noticed that the case he was handling was similar to the one he had processed a month ago. He got hold of the letter earlier signed by the boss and lost no time in copying it out and putting it up to the boss expecting that it will be okayed soon and sans scars. While Ms Condoleeza Rice’s talks in New Delhi are going to be wide-ranging, they can have a bearing on future defence cooperation between India and the United States. While the F-16’s are likely to figure in the talks, the United States is now offering India the advanced version of Patriot PAC-2 missiles with the radar of the latest PAC-3 missile so that as when India is ready, it can upgrade its anti-Ballistic Missile Defence (BMD) capability. 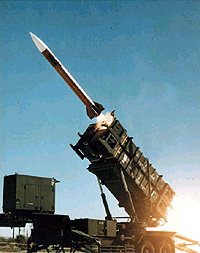 The PAC-2 or the Patriot Advanced Capability-2 system is required to launch the PAC-3 as well. India had sought the Patriot missiles a couple of years ago as part of the Next Steps in Strategic Partnership (NSSP) initiated by the Bush Administration, and last year, when former Deputy Secretary of State Richard Armitage visited New Delhi to familiarise himself with the new government, the acquisition of Patriot missiles was on the top of late National Security Adviser J N Dixit’s agenda. Apparently, the US has assured India of supplying what it wants even before Secretary of State Condoleeza Rice’s visit to New Delhi. That’s why a high-level defence delegation, including representatives from the Patriot manufacturers Raytheon, visited India last month to meet with Indian Army officials. Discussions between Mr Dixit and Mr Armitage are reported to have covered the acquisition of Patriots and dual use US technology in space and nuclear fields with India giving the assurance that it would not share it with any other country. Talks during the visit of US Secretary of Defence Donald Rumsfeld to India later brought the two countries closer. Foreign and Indian diplomatic sources say that New Delhi’s declared policy of No-First-Use (NFU) on nuclear weapons is appreciated in Washington and elsewhere, and that New Delhi’s perception of threats are also understood. Although the sale of weapons item-wise to India is unlikely to be on Ms Rice’s agenda, she would be keen to assure India of a continued strategic relationship and supply of the Patriots, which India desires to buy, and the F-16s which the US desires to sell in view of the Indian Air Force’s requirement of 126 Multi Role Combat Aircraft. Lockheed Martin, the giant US military aviation firm, has its last order of 80 F-16s from the United Arab Emirates (UAE), and if there are no new orders, its assembly lines in Texas, President George Bush’s home state, would close, causing a loss of jobs. Interestingly, while Raytheon is the main builder and overall system integrator for the Patriot missile defence system, which includes the power supply, radars, launchers, software and the PAC-2 missiles, the latest version of the missile only, PAC-3, is made by Lockheed Martin. Patriot, or Phased Array Tracking Intercept of Target, is the foundation of the US army’s integrated air and missile defence architecture, designed to intercept air-breathing aircraft and missiles. Each Patriot Fire Unit is ideally equipped with six PAC-2 and two PAC-3 launchers to engage a variety of targets, whatever the altitude, weather and jamming electronic clutter. As a Foreign Correspondent in West Asia, this writer had broken the news about Patriots’ deployment in Saudi Arabia in 1990 after the Iraqi invasion of Kuwait. It was a pleasant surprise accordingly to meet the US Army Officer who commanded the Patriot Fire Units then, 15 years later at the IDEX 2005 defence exhibition in Abu Dhabi last month. Major General (retd) Joseph Garrett, now a Vice President with Raytheon, has given a comprehensive indication of what is being offered to India. He said that Raytheon could not offer the system without the US Government’s approval, and that India could buy the PAC-2 (GEM+) version with PAC-3 ground equipment, Radar and Engagement Control Station. Billions of dollars had been invested in developing the system since the first Gulf War, and today it can react “in a second” and engage aircraft, cruise and ballistic missiles. In 1990, Patriots scored 70 per cent hits in Saudi Arabia and 40 per cent in Israel against Iraqi scuds. In 2003, all the nine Iraqi missile attacks were 100 per cent engaged to kill. Gen Garrett, and Raytheon’s Managing Director (Middle East) Kent Swanson, also said that India would have to build a comprehensive radar cover to identify any incoming threats. Patriot’s own radar covered only the area it was deployed in, and the Indian Army would have to work out its requirements in terms of numbers and locations. Gen Garrett explained that a PAC-2 launcher fired four missiles, which attacked a threat with blast fragmentation, or shrapnel. The PAC-3 launcher fired 16 hit-to-kill missiles to destroy oncoming threats with direct hits and the resulting kinetic energy. The PAC-3 is a “complimentary” system. Although a standard Fire Unit has eight launchers, their number can be doubled to 16. At present, Patriot is deployed by the US, Germany, Saudi Arabia, Kuwait, the Netherlands, Japan, Israel, Taiwan and Greece. It may be noted that Raytheon is already supplying AN-TPQ/37 artillery Weapon Locating Radars (12 units for $ 190 million) to the Indian Army. It is also engaged in discussions with the Indian space authorities in accordance with the NSSP programme. Mixed broadleaf plantings at least 25 feet thick and conifers 50 to 100 feet thick can drop noise levels by up to 10 decibels. For year-round noise reduction, plant a mix of evergreens such as arborvitaes, spruces, pines and hollies. To be effective sound barriers, these trees must have foliage that reaches to the ground. But noticing noise might be as much psychological as physical. When you don’t see the source of the sound, there’s an implied screening that makes it less apparent. So the use of plantings between you and the noise at any width is valuable for most home landscapes. That’s also a good reason to install something to try to camouflage noise. Installing a fountain, music and screening might further contribute to a quieter yard. Music in the garden—classical, country, jazz or whatever you prefer—can have a profoundly soothing effect on your surroundings, and make the world around you seem to fade away. Some weatherproof speakers specially designed to be used outdoors have a very good sound. I even have seen high-quality speakers in housings designed to look like ordinary garden rocks. Despite these measures, however, noise control is most effective when a solid barrier is used. When the Montgomery County, Md., Office of Environmental Policy and Compliance checked decibel levels from behind a wide band of plants, highway noise didn’t change significantly from summer to winter. Consider the following example: Next time you’re driving down the highway, note the surge of noise that fills the car when you crack open the window just a fraction of an inch. It doesn’t take a large opening for noise to get through. In just this way, any opening in mixed plantings will allow lots of noise through. This illustrates the difficulty of protecting your landscape from undesirable sounds exclusively with plants. The most effective measures you can take against noise with plants depends more on the configuration of the soil than the tree or shrub you’re putting into it. The best way to reduce noise is to establish a soil berm for your plantings: Large mounds of soil thickly planted, as described above, do a much better job of blocking sound than plants alone. Make your berm as high as possible, at least eight feet tall and 20 feet wide, and as long as your property line. A solid, well-planted berm can cut auto and truck noise by 70 to 80 percent and substantially reduce sounds from playgrounds, sporting activities or factories. You can also effectively dampen noise for a small townhouse or postage-stamp-sized property with a fence or wall. Install a fence or wall with no openings that is tall and dense enough to shield outside clamor. It will work just like the barriers you see along the highway. These types of barriers are far more expensive than your typical garden-variety fencing because they have to be completely sealed. The measure, passed unanimously yesterday by the rubber-stamp Chinese parliament, says that the mainland should use force against Taiwan if the island secedes or “if possibilities for peaceful reunification are completely exhausted”. Even though the text does not specify exactly what China would consider as “secession”, the law drew an angry response in Taipei, where President Chen Shui-bian said it would create a backlash, and “only end up driving both sides of the straits further apart”. Already it has prompted a rare show of unity between the Taiwanese government and the feuding opposition parties. The law, said Joseph Wu, chairman of the Mainland Affairs Council and Taiwan’s top China policymaker, “violates our fundamental rights” and had caused “utter resentment”. Taiwan separated from China when the Communists took power on the mainland in 1949, but Beijing insists that the island, with a population of 23 million, is part of its territory. Although the US recognises only the government in Beijing, it sells arms to Taiwan, and is committed to defending it against outside attack. In Washington, the Bush administration issued a sharp warning that the move threatened to undo recent improvements in relations between Beijing and Taipei, and reiterated its opposition to the use of force to resolve the issue. The worry in Washington is that Taiwan will retaliate, perhaps by edging closer to formalising a de facto independence that already includes separate elections, its own constitution and diplomatic relations with some countries. This in turn could be the trigger for a Chinese military move, leading to a showdown between the US and Beijing. Such a prospect horrifies a region already on edge over North Korea’s nuclear programme. In Tokyo, the Japanese Prime Minister, Junichiro Koizumi, urged both sides to work for a peaceful solution of their disagreement, to avoid “negative impact”. A showdown between the US and China would oblige Japan and other countries, such as Australia, to choose between the US, their traditional ally and military guarantor, and the local economic superpower with whom they have ever more important trading ties. Charity is a duty unto every Muslim. He who has not the means thereto, let him do a good act or abstain from an evil one. That is his charity. No violent extremes endure; a sober moderation stands secure. Establish the truth in your mind, for the truth is the image of the eternal; it portrays the immutable; it reveals the everlasting; the truth gives unto mortals the boon of immortality. If there were numberless mountains of gold and silver as big as mount Kailasha, they would not satisfy an avaricious man; for avarice is boundless like the sky. We are heirs to all the good thoughts of the universe, if we open ourselves to them. Whatever pleases God is good and pleasant. Never boast of your wealth, friends and youth. Time may steal away all these in the twinkling of an eye. Giving up attachment to this world which is full of illusion, try to realise Brahman soon and merge in it.